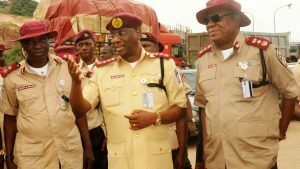 FRSC redeploys 71 senior officers in massive shakeup – Royal Times of Nigeria. Sani Abdullahi, Media Assistant to the Corps Marshal, said the redeployment takes immediate effect. The Corps Marshal, Federal Road Safety Commission (FRSC), Dr Boboye Oyeyemi, has approved the redeployment of 71 senior officers nationwide for enhanced performance. The News Agency of Nigeria (NAN) reports that the redeployment, aimed at repositioning the commission, affected three zonal commanding officers alongside several sector commanders. He was replaced by Corps Commander Imoh Etuk, who was formally the Corps Public Education Officer at the headquarters. In the redeployment released by FRSC Secretary, Susan Ajenge, Kingsley Agomo, the former Zonal Commanding Officer of Zone 7, Abuja, was moved to Zone 6, Port Harcourt.